WELCOME TO THE "CAR" MUSEUM. It's the newest of the museums having been broken off of the "Other Technology" Museum when I purchased my 1972 Fiat 850 Spider in October 2007. Click below to go directly to one of the cars or read on about how wonderful and important cars are, but also how we must make wise choices to limit the negative impacts of cars. History and Growth. Cars are one of the most significant technologies ever introduced. The first practical four wheeled vehicle with an internal combustion engine was not introduced until 1886 and it was not until the early 1900s that cars really took off. (History of the Automobile at about.com.) According to Number of Cars in 1900 there were 8,000 or fewer motor vehicles in the world. As of 2014, it its estimated that there are over 1.2 billion cars in the world and that there may be 2 billion by 2035. There are about 250 million motor vehicles in the United States alone. (Green Car Reports (July 29, 2014). The United States had 142 miles of paved roads in 1900. Today it has 5.1 million miles of paved roads according to Wiki Answers. Freedom to Travel and Effects. The car plays an important part in the lives of the majority of people in industrialized nations. It creates tremendous freedom to travel great distances on ones own schedule. People can work further from their homes allowing for the creation of suburbs which are generally defined as residential areas, often with many single family houses, on the outskirts of a city or downtown area. (Wikipedia - Suburb.) I am a child of the suburbs and still live in a suburb. I, like many, think they are great places to live and raise a family. They also lead to communities which are very spread out causing urban sprawl, a dependence on cars, traffic congestion and increased pollution (see below). An alternative may be The New Suburb, Sprawl versus Smart Growth, National Geographic. People seem to have a love affair with their cars with dozens of manufacturers producing hundreds of models which change every few years. Besides housing, cars and related expenses for fuel and upkeep generally account for the largest expenditure in households in industrialized countries. There is also a huge communal expense for the millions of miles of roads. Use of Finite Petroleum. Cars are also, of course, closely associated with petroleum from which gasoline is refined. Petroleum, or crude oil, was formed by the compression of plankton and algae over geologic time. (See EIA-Energy Basics - Petroleum.) While known in ancient times, the commercial production of petroleum did not really start until 1859 with the first well in Pennsylvania. Demand was not great until the internal combustion engine became common. (See Wikipedia - Petroleum.) Petroleum is a finite resource meaning we only have so much of it. According to Tim Appenzeller, The End of Cheap Oil, National Geographic Magazine (June 2004), estimates are that the production of petroleum world wide will peak in the next 5 to 30 years and then go down from there. Demand continues to increase especially with developing countries like China using more energy, switching from bicycles to cars. Bottom line is that we will have used up the majority of readily extractable petroleum resources within 200 years of that first well in Pennsylvania. Future cars will have to rely on something other than petroleum. Environmental Consequences. In addition to reducing petroleum reserves, cars have significant environmental consequences. Cars create significant conventional air pollutants such as nitrogen oxides, ozone, and carbon monoxide. Significant strides have been undertaken to control these pollutants since the enactment of the Clean Air Act in the early 1970s. 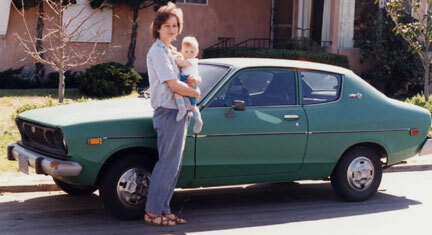 By 1975 cars generally required catalytic converters as my 1975 Datsun B-210 had. Cars also produce carbon dioxide. Carbon dioxide traps heat providing a good temperature range for life on Earth. Carbon dioxide levels in the atmosphere have been increasing, however, since the increased use of fossil fuels like petroleum and coal with the industrial revolution and especially in the past century with the advent of the motor vehicles. These increased carbon dioxide levels also appear to be causing an increase in global temperatures. (See United States Environmental Protection Agency (USEPA) - Basic Information - Climate Change.) Carbon dioxide emissions can be reduced by having fewer cars, driving less, or increasing the gas mileage of cars (how far a car can go on a gallon of gas). Advances in Cars. Significant advances have occurred in my lifetime in car technology. Perhaps the biggest area is car safety. When I was born I was brought home in my mother's arms with no car seat, no seat belt, no shoulder harness, no air bag, no antilock brakes, no disc brakes, no crumple zones, and the large metal dash board of my dad's 1953 Chevy. Padded dashes became more common by the late 1950s. (As a young child I chewed the dash board of my parent's 1957 Ford Fairlane (I think) station wagon while anxiously watching Pollyanna at the drive-in theater leaving my teeth imprints. Try that with a metal dash board!) Seat belts became mandatory in the early 1960s. Shoulder harnesses were added in the late 1960s. (I remember by sister's and brother's 1967 Datsuns did not have them, but my dad's 1968 Datsun did have shoulder harnesses.) Child car seats became common in the 1970s. Antilock brakes were introduced in the 1980s although many cars still do not have them. Air bags were introduced in the 1980s and dual air bags are required in all new cars today. Many cars have side curtain airbags. Cars are crash tested and designed to crumple, with the car, not the passengers, receiving the energy of a crash. Many cars today have stability control devices. Cars also pollute a lot less today than they did when I was a kid. Cars also are much more reliable with tune ups often not required for 100,000 miles. The majority of cars are front wheel drive today, a rarity when I was a kid. (I remember my dad getting a 1972 Audi which was front wheel drive.) 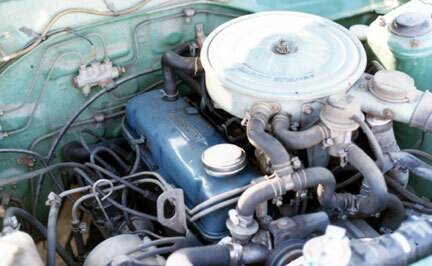 Cars today also have fuel injection instead of carburetors. Many functions are controlled by on board computers. Today you can find your way around with GPS (Global Positioning System) devices in the car. Need for More Significant Advances. Despite being such a significant technology, cars in many ways have not changed that much since early 1900s. Most still use gasoline. Almost all use internal combustion engines. (See keveney.com for a neat animated diagram of how a basic four stroke engine works. See also How Cars Work.) Hybrid cars are a significant new development, however. They combine a gasoline engine with an electric motor. The car usually starts up in electric mode and then switches to gasoline. Both the gasoline engine and electric motor can be used when needed. The electric motor is charged when the car is slowing down or braking. In this way that energy is not lost. Rather the kinetic energy that would otherwise be lost is stored in the batteries as potential energy for later use. The system works. 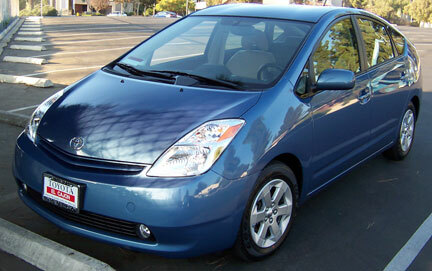 I have a 2005 Toyota Prius as described below which during my daily commute gets nearly 50mpg. The car is very smooth, has plenty of power, and is very roomy. It fits 5 people. It is a hatch back. With the seats folded down I have loaded it at various times with two bicycles, one tandem bicycle, a long board surf board, or furniture. It has never had a mechanical failure in nearly 40,000 miles of driving now. The Prius is the highest mileage car in the United States with new EPA mileage figures of 48 city and 45 highway. (Notice that the figures for my 2005 Prius were 60 city and 51 highway. This reflects the EPA's change to more realistic mileage ratings.) Fuel cell vehicles offer a radical new technology as explained at www.fueleconomy.gov but are still years away from practical implementation. Wise Choices. What can people do today to still enjoy the freedom of cars but reduce the environmental impacts? Choose the smallest car you really need. Force = mass x acceleration. The force needed to move a car is therefore directly proportional to its mass. All other things being equal, the lighter the car, the better the mileage. Its nothing new. That's why the 1972 Fiat 850 Spider and the 1975 Datsun B-210 got good mileage and the 2007 Toyota Yaris gets good mileage. A light car no longer equates with a dangerous car. Many small cars, especially with side impact air bags, are very safe. (Side impact air bags should be more widely available on cars like the Yaris, however.) Heavy cars are more dangerous to other drivers. Get only the performance you really need. You need a car that will keep up on the freeway. You don't need a car that will travel 100mph. Most people would do fine with a small 4 cylinder vehicle. Unless you need to go off road on a frequent basis, get a two wheel drive vehicle. Most front wheel drive vehicles today, especially with traction control and antilock brakes, work fine even in snow. Consider innovative technologies like hybrid cars when buying a new car. They may cost a little more, but will help you save money over the long term and help society and the environment. Look at EPA ratings carefully when buying a car. Also, look at more realistic figures in Consumer Reports and other publications. Cars in the same size class often vary widely in the mileage they get. Your driving patterns and maintenance of your car are important. Drive at reasonable speeds. Increased speeds dramatically increase aerodynamic resistance. Maintain your vehicle. Make sure tires are properly inflated. Drive less. Take public transportation when possible. Walk. Ride a bike. Support efforts to increase mileage standards for cars. Support research for new technologies such as fuel cell vehicles. 1972 Fiat 850 Spider. My oldest and most recent car! This is my only collectible car. All the cars below were purchased for every day transportation. The Fiat 850 was purchased as a testament to fine Italian automotive design and for plain old fun! 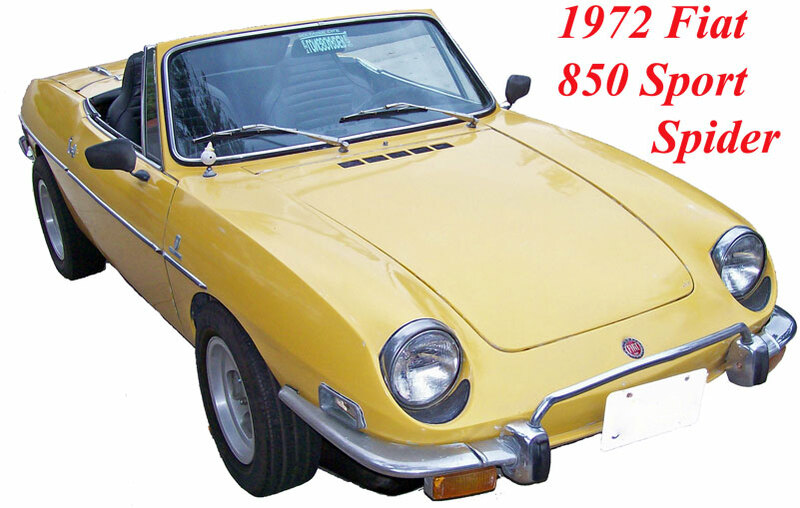 I purchased my Fiat 850 well used on October 19, 2007 for $1300 in Oceanside California from an ad in Craigslist. About 25 miles into my trip home on the date of purchase the oil pressure gauge dropped precipitiously low and the oil pressure warning light came on. I managed to get over to an off-ramp and called the Auto Club. The oil level was fine so it is not a leak causing the drop in pressure (although there are oil leaks.) It is now at a garage in the Miramar area of San Diego with the engine being torn apart to see what's up. Sounds like the classic joke where the used car falls apart on the way home, doesn't it? As I said to my wife on the cell phone on the side of the off ramp, "but it sure is cute!!!" It is, of course, 35 years old. It is in decent shape for a car that age. It has a little rust on the trunk near the front. That's apparently a common place for rust. There are a few other rust spots, but nothing big. The seller said the head was at least partially rebuilt with new value guides. The tires are in good condition with Michelin X radials on alloy mag wheels. The wheels are not original but look to be sort of 70s vintage in good condition. Up until the oil pressure loss the engine was working. (I got over quickly and it continued to work. It had a funny smell but no funny sounds.) Transmission works. The seller said he put in a new clutch about two years ago. The brakes work, although I don't know how much wear they have. The parking brake barely works. The speedometer does not work. The steering wheel is a little loose. The doors sage. (Apparently, a common problem. Hard plastic door bushings to shore up the hinges are available for about $35 on eBay. Seems a little pricey for plastic.) The door handles do not work from the outside. It has an aftermarket removable hard top in good condition. There are no rear latches for it, however. The steering wheel is a bit loose. The heater has been removed. It has a Crane ignition system which replaces the stock points system with an optical trigger system. As a pre-1976 vehicle it does not have to pass smog in California. Now, for the big question. Why did I buy it?! It's Italian baby! It's really cute, cool and sporty! When I was about 15 I walked past one everyday on my way to school. It was parked at an architect's office on University Avenue in La Mesa, California. The car has beautifully flowing, clean lines. It was designed by the prestigious Italian design group Bertone whose credits include designing cars for Alfa Romeo, BMW, Ferrari, Lamborghini, Maserati and Lancia. Betrone states: "The Fiat 850 Spider was one of Bertone's great success stories. Betrone describes it as: "the little spider with the big personality" and "the small sporty number which is still much-loved around the world today." Nearly 140,000 units were produced. Betrone states: "This small spider with its rear-mounted engine stands out for its smooth, essential lines and some really great details, like the headlamps tilted to follow the lines of the wings, and the dihedral side panels inspired by the Corvair Testudo, designed by Bertone in 1963." The individual designer was Giorgetto Giugiaro as described at ItalDesign Heritage who in addition to dozens of car models designed the Nikon F3, F4, F5, F6 and D30 camera bodies and a prototype next generation Apple Macintosh computer according to the Wikipedia article on his life. Some say Fiats have a reputation of being poorly built. For example, a June 2006 Road and Track magazine article suggesting (perhaps tongue in check) it may be an up and coming collectible states: "The basic driveline was pretty stout, but there were chronic problems with kingpins and axles. And rust." (My seller indicated my kingpins had been replaced. If only I knew what a kingpin is! Anyway, I'm learning a lot about cars.) While FIAT actually stands for "Fabbrica Italiana Automobili Torino (Italian Automobile Factory of Turin)" (Wikipedia article on FIAT), the old joke is it stands for "Fix it again, Tony." (carbuyingtips.com.) All in all it seems to have been a relatively reliable, economical car that was easy to work on. While not rare, it does take a bit of looking to find one nearby. Much more common are the front engine FIAT 124 Spiders. While there are not a huge number of Web sites or pages devoted to the Fiat 850, there are several listed below in several different languages. Keep posted. I will add more information about my Fiat as my Italian car journey continues. Also, I have purchased some old ads, articles and booklets on e-Bay. Ciao! Update August 2016 - I would call the repair shop periodically over the years with a reply that it would be done in two weeks, then a month, etc. Eventually, the repair shop changed owners. I picked up my car in 2015 although the engine was gone! It sat on my driveway for another year and a half. In August 2016 I donated it to the Sierra Club Foundation. I learned a valuable lesson at least for myself. I shouldn't try to recapture my dreams as a youth at least when it comes to cars! I am keeping this in mind now that they have just introduced a new 2017 Fiat 124 Spider. 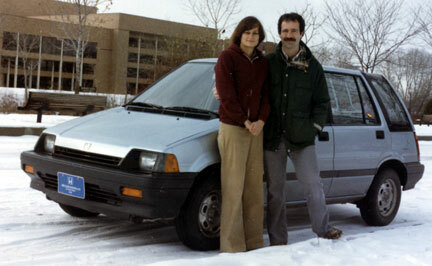 1985 Honda Civic Wagon, purchased new December 21, 1984 in Boise, Idaho for about $8,055 including tax and license. We financed part of the cost at 13% interest. This was primarily Lisa's car. It was an automatic with a 1.6L engine. We gave it to my son's friend on December 28, 2004. It gave us 20 years of excellent service with relatively few problems. 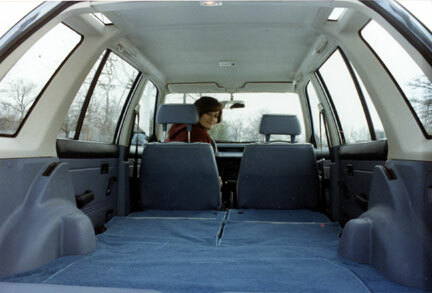 It had a very spacious and versatile interior with relatively good fuel economy (EPA 26/28). We still wish they made this model. Click for photographs of the vehicle when new in Boise. 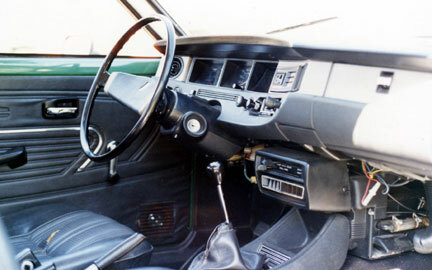 New, Interior. 1988 Dodge Aires Wagon. Purchased February 1988 for $10,200, tax and license included. It was given to St. Vincent de Paul Center on December 28, 2004 with approximately 126,000 miles. The Aires and Plymouth Reliant were the original Chrysler K cars, which along with the Chrysler mini-van, helped Chrysler out of difficult financial times in the early '80s. 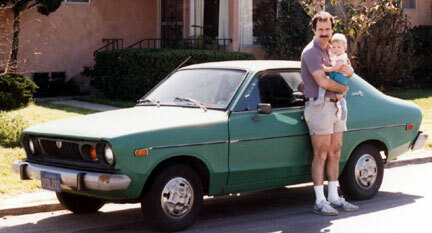 1988 was the last year for the wagon, with the sedan being phased out the following year. It had a 2.5 liter 4 cylinder engine with reasonable gas mileage of 23/29 EPA rating. It was a relatively reliable car although the engine leaked oil and the air conditioning broke down on multiple occasions. 2005 Toyota Corolla, purchased for my older son in June 2004. It has a 1.8L engine with 130 horsepower. The Corolla gets good gas mileage with an EPA rating of 29 city, 38 highway, although actual mileage is less. The Corolla is assembled in Fremont, California. 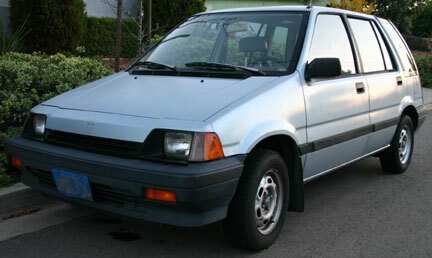 It represents a great improvement over my 1975 Datsun B-210 with much more power and air conditioning! 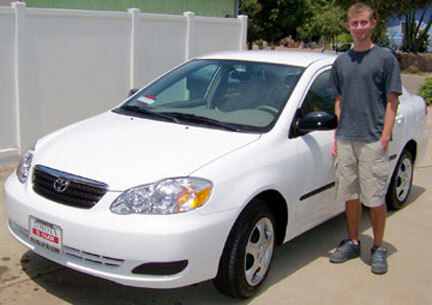 The Corolla is the most sold car model in the world ever! (See Edmunds, "Generations".) My son eventually sold the Corolla in 2015 for $3,000 and leased an electric Nissan Leaf. He is now driving a Nissan Rouge Sport. 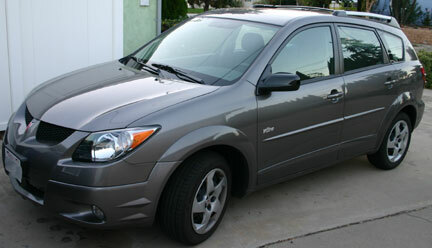 2004 Pontiac Vibe, essentially the same car as the Toyota Matrix with minor cosmetic differences. Both the Vibe and Matrix have the same drive train as the Toyota Corolla and are assembled in the joint General Motors-Toyota plant in Fremont, California. The Vibe has a versatile interior with the rear seat folding flat. It has an EPA rating of 28 city, 34 highway which is among the best for wagons. The Vibe was purchased in July 2004. 2005 Toyota Prius, truly belonging in a museum as a revolutionary car, the Toyota Prius is the highest mileage car in the United States with more than two seats. It does this while being a mid sized car. It is an engineering marvel. It has a hybrid gasoline engine and electric motor. The 1.5L gasoline engine produces 76 horsepower, while the electric motor produces 67 horsepower, which combine to produce 110 horsepower. The Prius is also one of the most aerodynamically efficient vehicles on the road. It is very roomy and comfortable. The hatchback design and split rear seats which fold flat give it ample cargo room. It handles well and has surprisingly good power. The mileage is phenomenal with EPA ratings of 60 City and 51 Highway with a combined rating of 55mph. While actual mileage is less, we have consistently gotten between 44mpg and 48mpg in mixed driving. Mileage in Consumer Reports tests was 44mpg. We waited on various lists for about 10 months before we could get a Prius. The gasoline engine and electric motor work together seamlessly. Usually the car starts silently in electric mode. At about 20 mph the gasoline engine kicks in. When you stop, the gasoline engine automatically shuts off. 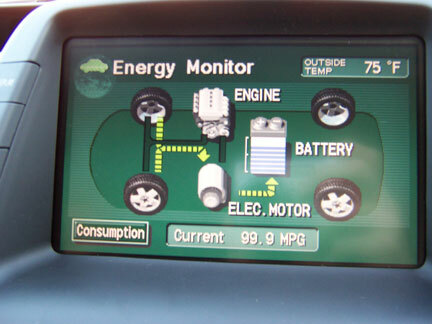 The interplay between the electric motor and gasoline engine, as well as the instantaneous mileage, is continuously shown on the monitor in the middle of the dash board. Another unique feature is that the car starts with the press of a button rather than with a key. Prius is truly a remarkable, environmentally sound car! Click for more photographs: Front, Back, Engine/Motor, Dash, Monitor. 2017 Update: The Prius is still going strong with about 148,000 miles. I recently gave it to my son to replace his Yaris. 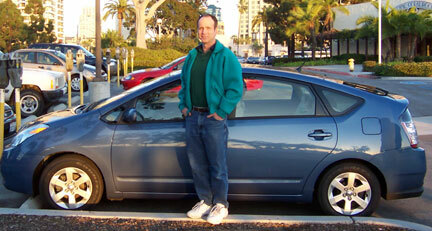 The Prius was rear-ended on the freeway in 2010 and nearly totaled with nearly $10,000 in repairs. It survived, however, with no problems. At about 146,000 miles the hybrid battery failed. I replaced it with a reconditioned battery for about $600, plus an additional $180 for the guy to come from Los Angeles to replace it. So far it is doing fine. We will see how it goes. The dealer wanted over $3,000 for a reconditioned or new hybrid battery. About two or three years ago the instrument cluster would occassionally go out. This is a known problem. As I recall the dealer wanted well over $1,000 to replace the meter and reprogram it. There is an exended warranty on this problem, but as I recall it is limited to ten years from the date the car goes into service. I was outside this time period. I purchased a reconditioned meter on eBay for around $140, with somethink like $40 returned to me when I sent back my meter. The reconditioned meter was within 20 miles of the odometer reading on my old meter. You have to remove the entire top of the dashboard to replace the meter. Luckily there is an excellent video at Boulder Hybrids that guides you through each step. It worked and saved me a lot of money! In late 2016, I replaced the hatch supports for about $30 or $40 with non-Toyota supports at Amazon. It is an easy install job. The car has a separate water pump for the inverter. The dealer replaced this originally as part of a recall. It failed again a few years later in late 2016. Toyota would not replace it for free this time. When I complained about that and the instrument cluser, Toyota did give me some compensation. The 12 volt auxillary battery has been replaced twice in nearly 13 years, the most recent in May 2017. They are expensive - about $350 at the dealer. They do seem to last a long time, however. The brakes last a very long time with the regenerative braking. I don't recall ever having a brake job in nearly 13 years. Tires tend to wear relatively quickly on the Prius since it is relatively heavy for its size due to the hybrid system. I have had good luck with Michelin Defender tires, however. The last set is over four years old. The paint was good until about a year ago. Since then the clear coat on the roof has been flaking off. A good testament to the reliability of the Prius is their use as taxis. The last time I went past the San Diego Airport, the taxi stagging area had dozens and dozens of Prii. I did not see any other model of car! As described below, my younger son needed his Yaris replaced. I was considering getting the new Hyundai Ioniq hybrid and giving him my Prius. I am interested in the plug-in, however, which will not be out until Fall 2017. I therefore explored used cars. At a local used car dealer I saw a Prius just like mine, including the same color, with about 114,000 miles and in nice cosmetic condition. It was manufactured 6 months after mine. It seemed a little pricey, but two weeks later I noticed the price had dropped $1,600. I went over that evening, test drove it, briefly negotiated and bought it for a total of $6,200 including tax and license. The whole transaction took a little over an hour. 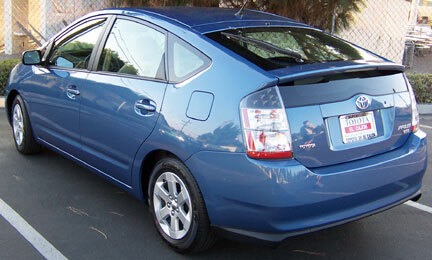 I'm taking the newer Prius (Blue2) and gave my son the existing Prius (Blue1). Blue2 came with only one transponder key. I bought a genuine Toyota one on Amazon for $110 and successfully implemented the programming of it. The programming is called by many "the chicken dance" and involves well over a dozen steps including things like opening and closing the door five times! These steps at PriusChat worked for me the first time! The two Prii are seen below! 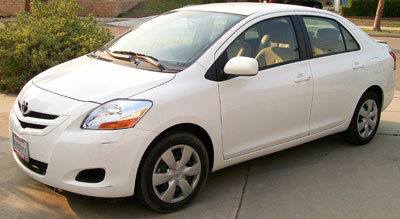 2007 Toyota Yaris Sedan, purchased for my younger son in March 2007. 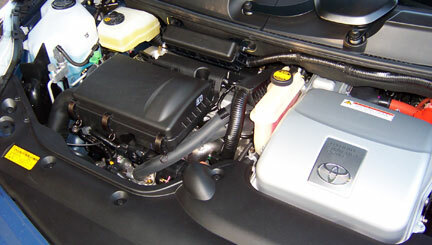 1.5 liter four cylinder gasoline engine, which is the same engine as in the Toyota Prius hybrid car. The Yaris is the current leader in fuel economy for non-hybrid gasoline cars in the official EPA ratings at www.fueleconomy.gov. I find it to be a practical, fun to drive small car, although it has gotten mixed reviews. Compare Edmunds (they like it) with CNET (just average). I think it is a great little car, although I agree with CNET that antilock brakes and side curtain airbags should be standard. They are both difficult to find. 2017 Update: With about 176,000 miles, a significant clunking sound and loss of power occassionally when it shifted from first to second, and significant cosmetic issues, my son donated the Yaris to KPBS in June 2017. I gave Blue 1 (see above) to my son. 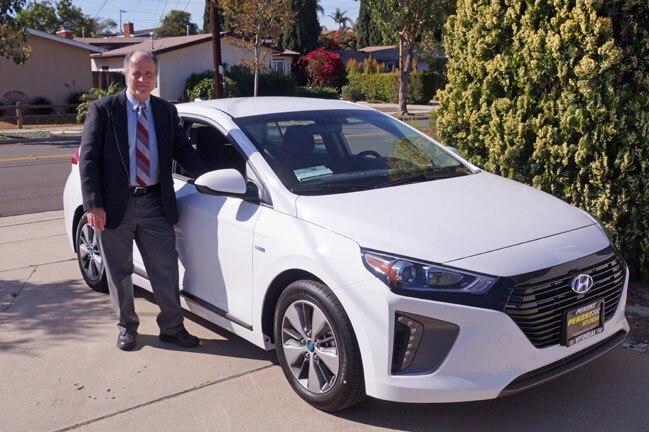 2018 Hyundai Ioniq Plug-in Hybrid. 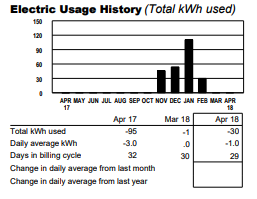 As described in the Prius section, my first Prius had the hybrid battery replaced in February 2017. Unfortunately, the $800 reconditioned battery lasted only about 14 months, dying in April 2018. We therefore traded that Prius in and my younger son got the Prius I purchased in June 2017. 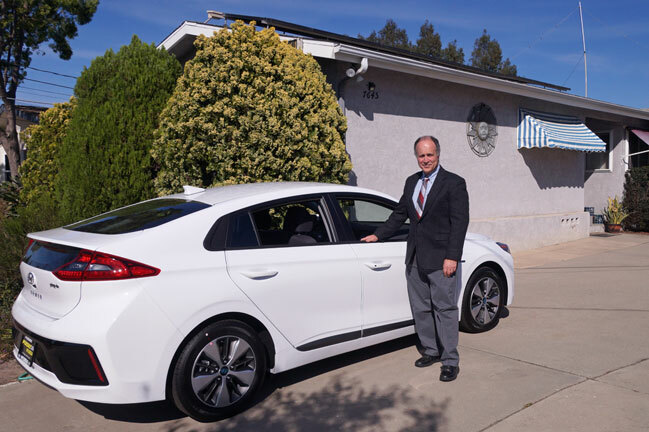 In April 2018 I purchased a Hyundai Ioniq Plug-in Hybrid. The car can operate solely on electric power for about 29 miles. After that it operates as a regular hybrid with an EPA estimated 52 miles per gallon.